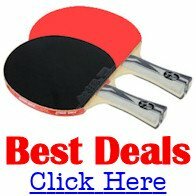 Top tips to help you choose your ideal table tennis ball. In part one we looked at the different types of table tennis balls and what the rules say about them. We also looked at the two most recent major changes made to the ball which affected the size of the ball and the material used to make them. So let's now take a look at the tests which are carried out on table tennis balls in order to meet the criteria set by the ITTF and then view a list of the balls which appear on the ITTF approved list of balls. The ball must be white or orange, and matt, and must appear to be uniform and only have one seam. 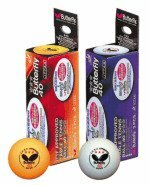 The stamp on the ball may cover an area no greater than 280mm2 and be printed in one or two colours, but the same colour or combination must be used for all balls of the same brand and the wording must comply with ITTF regulations. The balls must be packaged appropriately, e.g. in paper or plastic boxes or in a blister pack. And the wording used on this package has to contain either "40" or "40mm" for celluloid balls or "40+" for non-celluloid balls. The packaging of the balls must also contain a date or a date code and must comply with the ITTF regulations. The official rules state that the ball shall weigh 2.7g, but any weight between 2.67 and 2.77g is acceptable for any one ball. No more than 1 ball out of the 24 sampled may be outside this range. The sample mean must be between 2.69 and 2.76g. The official rules state that the ball shall have a diameter of 40mm. This is measured using a calibrated electronic device with a precision of at least 0.001mm and which measures the diameter with a precision of 0.01mm. For celluloid balls the minimum diameter of every ball must be at least 39.50mm, and its maximum diameter must not exceed 40.50mm. For non-celluloid balls the minimum diameter of every ball must be at least 40.00mm and its maximum diameter must not exceed 40.60mm. The sample mean average diameter, i.e. the mean of the average of the maximum and minimum diameters for each ball, must be in the range 40.00-40.50mm. The official rules state that the ball shall be spherical. The sphericity of a ball - or more correctly the lack of sphericity - is the absolute difference between its minimum and maximum diameters. By rotating the ball about its axes, the minimum and maximum diameters are determined. The difference between the two values gives the lack of sphericity. For celluloid balls the sphericity of any ball must be less than 0.35mm, and the sample mean sphericity must be less than 0.25mm. For non-celluloid balls the sphericity of any ball must be less than 0.25mm, and the sample mean sphericity must be less than 0.20mm. All balls must rebound to a height of not less than 240mm or more than 260mm when dropped from a height of 305mm on to a standard steel block. For non-celluloid balls all 24 balls must rebound to a height of not less than 240mm and not more than 265mm when dropped from a height of 305mm to a standard steel block. Veer is a measure of the total sphericity of the ball. It's measured by rolling the ball down a slight incline onto a horizontal surface, and measuring the distance by which it deviates from a straight line as it rolls across the surface. The incline is 100mm long at 14 degrees to the horizontal, and on a table that is 100cm long this gives a rolling time of about 3 seconds. No more than two balls can deviate by more than 175mm from the center-line and each ball is measured at least three times. Hardness is measured with a fully automated and computerised tester. A 20mm diameter pin presses against a pole of the ball and the indentation is recorded to a precision of 0.01mm. Measurements are made on each pole and the average for the poles provides a measure of the hardness. The colour of the ball must meet the colour specifations which have been set for either white or orange. No other text is permitted. The following is a list of ITTF approved 40mm table tennis balls valid from 1st January - 31st December 2019.